Commonly known as USA, the United States of America is a vast nation in North America. With more than 310 million inhabitants, the USA boasts being one of the highest populated countries on the planet. It has vast natural landscapes, extensive urban and suburbs and highly dense cities. For tourists visiting the USA will never get bored or run short of things to do. The fun is unlimited with pristine sandy beaches, picturesque scenic views, landmarks, appealing attractions and never-ending adventure. 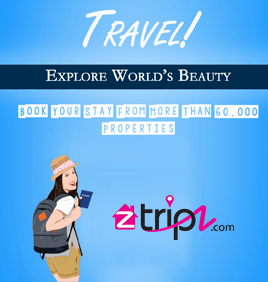 From natural wonders of Alaska and Yellowstone to breathtaking skyscrapers of Chicago and Manhattan and the exotic beaches of Hawaii, Southern California and Florida, entertainment has no end if you choose the best place to stay at affordable prices only at Tripz.com. Travelling with bigger family? Why don't to get hold of the USA Vacation Rentals instead of expensive hotels? The vacation rentals in the USA are found everywhere, even at the most secluded places. While the rates are pretty alluring, the stay can be very comfortable and memorable. These vacation accommodations come complete with all the modern amenities and furnishing such as Master Bedrooms, immaculate bathrooms, fireplaces, well equipped kitchens, private swimming pools, hot tubs, Jacuzzis and spacious balconies. No matter what your budget is, there is something suitable for you. Natural Beauty: From the awe-inspiring Alaska glaciers to the vast Great Lake's waters, from the incredible Appalachia weathered peaks to the deserts of the Southwest, there is probably no land offering such a vast natural diversity like the United States of America. America's National Parks can be great when searching for the breathtaking natural views. The Grand Canyon mesmerizes travelers offering eye-catching gorges. Yellowstone National Park (the first national park on earth), Yosemite National Park, Glacier National Park (great mounds of ice) and Sequoia National Park are a few most popular national parks to mention. The Niagara Falls could be another attraction that will certainly take your breath away. Famous Museums and Art Galleries: Almost each country boasts a worth visiting museum. The Smithsonian Institution in Washington D.C. is home to 20 independent museums. The National Museum of Natural History, the National Museum of American History and National Air and Space Museum are amongst the most visited museums. You can easily spend weeks here exploring many new things and interesting facts about history. If you are keen to see classical museums, head to New York City. The Museum of Modern Art, the Guggenheim Museum, the Ellis Island Immigration Museum and the Intrepid Sea-Air-Space Museum are some of the outstanding museums here. How to Get in the USA? By plane is the easiest and the simplest way to get in this vast land. Once you get in, you can better hire a car or even try out domestic planes for travelling the different countries. Entering the country by sea is another way, which is mostly adopted by vacationers from outside Mexico and Canada. Visiting the USA at any point of time of the year is welcome. The diverse country has something for you no matter which part of the USA that you are in. However, the months of July and August are considered to be the hottest periods. This is the right time to explore the sandy beaches. Plan a trip to Orlando, Florida if your kid's school is over. The city has endless kids-friendly attractions at the most cost effective prices.